As part of the OUR FAMILIES project, a group of volunteers explored the use of archives in Creative Writing. Some of the stories which emerged from this are shown below. Each one is shown alongside an illustration of the document which inspired it. They show how different types of archive records can be used to inspire writing. CLICK HERE to see this full page of the Corporation Account Book, 1755/1756. The archives in the town of Berwick upon Tweed hold the ancient accounts of the Corporation. These fragile old books, with their flaking pages and hand-written entries, make reference to many of the characters who lived in the town and how they earned a living. Edward Collins, mole catcher, was one such character. 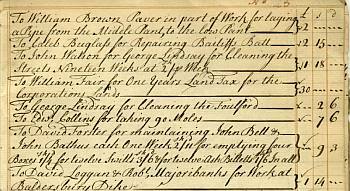 The account books show that he was working for the Corporation in the 1740s and 1750s and that he was paid a penny a mole for his labours. The work was highly seasonal; the accounts for 1755-6 list weekly payments from March to July. There is no record of how he made a living for the rest of the year. Edward’s birth and death are recorded in the parish registers of Ford in Northumberland. He was born on April 12th 1726 and died on January 2nd 1802. The burial record states: Edward Collins, Branxton, late gamekeeper at Ford Castle (died 2nd) aged 77 years. Edward Collins lived in Berwick during a turbulent period in Britain’s history. The events of the period are well documented, but the details of the daily life of Berwick’s mole catcher do not appear anywhere in the historical record. To discover more about Edward, his family and his neighbours it is necessary to employ a little imagination…. The wooden cart, laden with belongings, bounced and swayed up the steep track as it wound its way to the summit of the hill. Mary glanced back towards Ayton village and the sandstone castle, standing proudly on the brae, basking in the May sunshine.Tears welled up in her eyes as she gazed down at the long row of matching cottages where she had lived with her widowed father for the last five years, working the land alongside him, until the baby had been born just 8 weeks ago. The bairn stirred in her arms and her thoughts were jolted back to the present. Her Father had been hired as the new shepherd at Ford Castle now that she could no longer work in the fields. Flitting day had come round quickly and Ford was a long way from where Mary was planning to start a new life with her baby’s father, a young soldier from Berwick…. The records of the Ford and Etal Estate in North Northumberland were deposited in the Berwick Record Office many years ago. Slipped in amongst the invoices, receipts and other official documents was a folded sheet of parchment covered in spidery handwriting, it’s black ink faded but still legible. 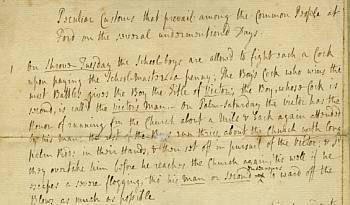 Entitled “Peculiar Customs Still Practiced in the Village of Ford”, the document is undated, but is believed to be late 18th century. This fragment of social history inspired the following story.